The 18mm, like all in this set, is a sharp, comfortable eyepiece. Excellent in all respects and highly recommended. good optics, and nice wide FOV. like the rubber coatings. Fees like quality construction. would buy again. 5.0 Astronomy nut for 55 years. I had bought Celestron LX eyepieces for my small scope. A Celestron 6”. They were nice, but suffered from blackouts if you’re eye position wasn’t perfect. These eyepieces have no optical quirks that I can detect. Great eye relief and pinpoint stars to the edge of field on a f/10 scope. Great eye relief and decently-wide field of view. Noticeable step up from a plossl without breaking the bank. A nice wide-field, 60 deg, but not too wide FOV....just perfect. Nice coatings and great contrast, sharpness to the edge, no internal reflections, just a great piece of glass as is the entire set!!! I like the 5mm version of this eyepiece very much. Like the 5mm, this 18mm is well constructed. It gives very good views in my f/10 refractor. In f/5 and f/6 reflectors the center 80% of the field is sharp, but the outer 10% looks curved and the focus is very soft. There's also a slight blur ring just inside the field stop. Overall it's a nice eyepiece, better than most 18mm wide fields I've tried, but it's not perfect. 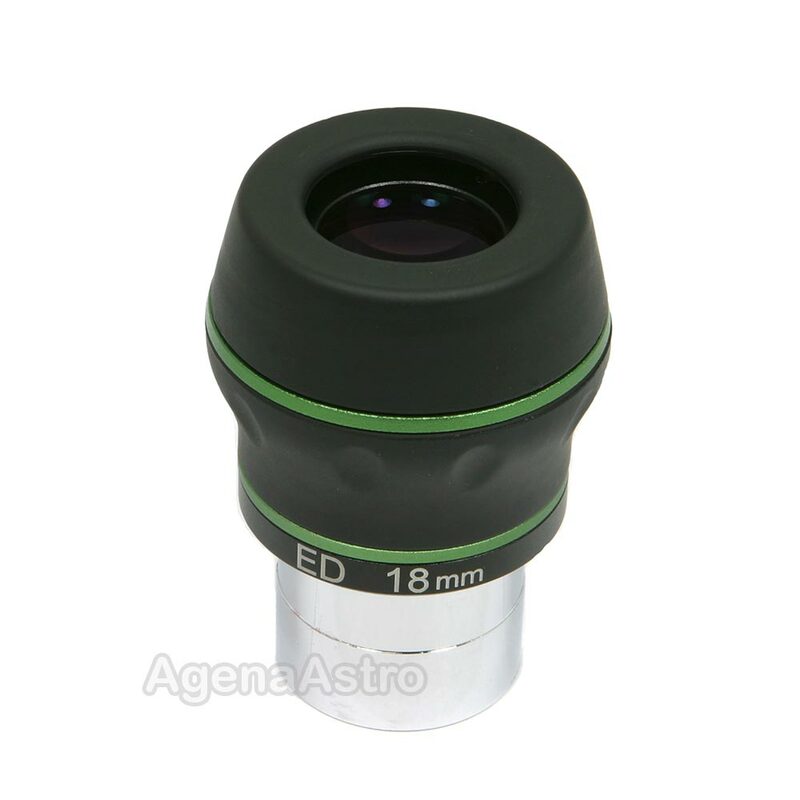 The Agena Starguider Dual ED eyepiece are the best available for the price, i believe. They have a wide, flat field and good eye relief. They are very comfortable to use. I have all rom the 3.5mm to the 18mm. You might pay a lot more and get an eyepiece that is better. But it won't be that much better! Review by N2KEN of Brooklyn, NY. These are very well designed and constructed eyepieces. They have a solid feel and the twist-up rubber eyecup is very smooth. I bought a pair for use in my TeleVue BinoVue and the 60 degree field of view is perfect. Views of clusters, the moon and Jupiter were sharp and clear across the entire field with my C6 sct. When I first opened the eyepieces I thought they might be a bit wide at the top for comfortable bino use. No problem. They are comfortable to use, have nice eye relief, and nicely matched with each other. The rubberized body provides a comfortable grip when handling them. The views were nicer with these 18mm in the bino than a single 15 or 9mm. Jupiter and four moons filled about 3/4 of the field. But, the view was sharp and clear with the cloud bands distinct. The contrast and clarity is very good. Stars were pinpoint sharp across the field and the moon's surface showed crisp detail. These will be getting a lot of use. I tried a single eyepiece for comparison and it was quite impressive. 4.0 Really nice for the price. Really works well for the price even in f/5 scopes. Review by jscarborough55 of Texas. Quality eyepiece. Great eye relief. One can feel the quality construction by just holding it. Agena Astro service second to none. Excellent eyepiece. Great value. Excellent Agena Astro service. I was intent on updating and retiring my old working sets of eyepieces and create a unified set that would be more versatile. These would have to have a high degree of resolution for binaries, high contrast for planetary work, and a comfortably wide field for deep sky work at all magnifications. After months of reading and research, I actually stumbled onto Agena's impressive lineup of oculars. The Agena ED oculars are extremely flat across their field with excellent color correction. The eye lens is incredibly large. No pinholes here even at 5mm! The apparent field of view is spacious enough for deep sky with excellent resolution for binary star busting. Their high contrast is great for bringing out subtle deep sky object and planetary detail. All this is accomplished with just 5 lenses in 4 groups. They do not rob me of precious light as more complex designs would. The feel and build quality is simply first-class. I bought the entire ED series and am delighted in their performance with my 3" & 4" Unitrons and 6" AVX refractor. These and my Agena BSTs are a tremendous value.